READ MORE : Small World connectivity in rural road networks | Who is getting the jobs? 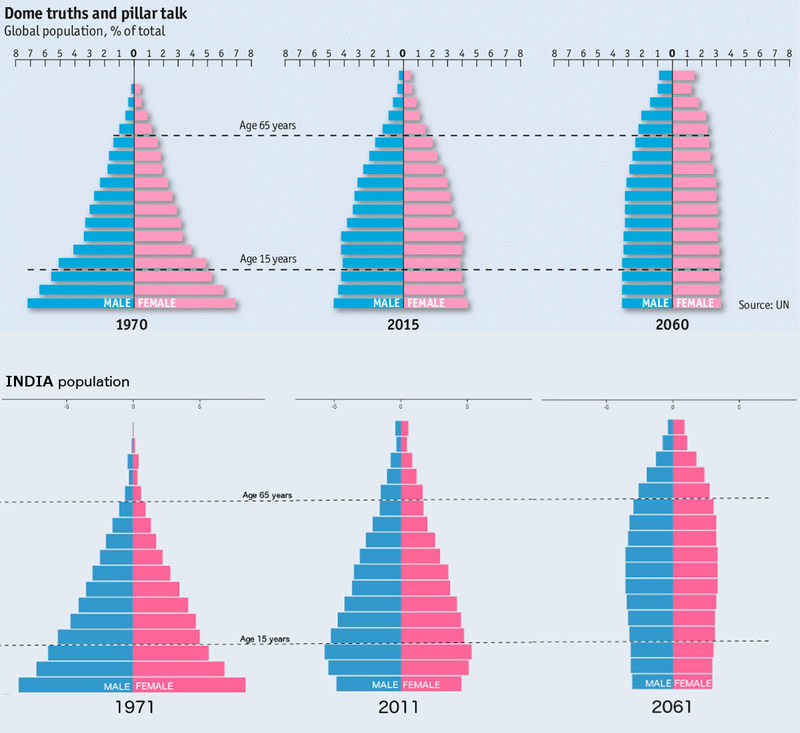 So many questions were thrown open by this global population structure chart. We did a little digging up of Indian census to get the population structure in India. Here is a comparison between India and Globe. Definitely India is following the global structure but with a difference or possibly delay. To look at the differences in more detail, we plotted the difference! What could be happening in India? 1. Indian healthcare are much weaker than global averages (unless we believe Indians have lesser life span than global, but assuming it is not significant). Longevity of life increased more than global [the % of people >65 years matching with global value in 2011 compared to 1971]. Healthcare in India improving at a faster pace. 2. Fertility rate has more than halved (from 5.7 in 1966 to 2.4 in 2012) in India. In the 0-5 years category, India is matching with global structure by 2011. 3. Predictions for 2061 : Working class [between 15 and 65 years] is higher than the global average and >65 years category is much smaller compared to global averages. 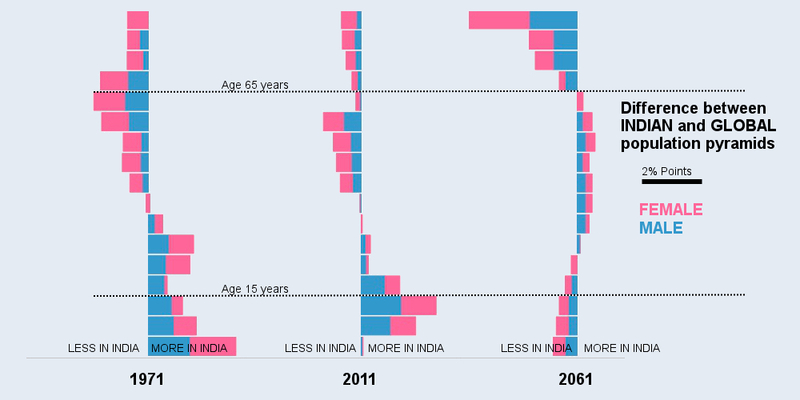 India might be the place to age in 2060 [Luckily I will be 77 years old and mostly in India then!]. READ MORE : Is Federer-Djokovic rivalry a continuation of Edberg-Becker rivalry? | Does age matter in PBL(Premier Badminton League 2016)?